I was really looking forward to the birth of my first Grandchild – but sadly things didn’t work out as I had hoped. She was born on 4th December 2010 weighing 6lbs 12oz and we were lucky enough to be present at her birth. She looked just like my daughter (her mummy) and was called Lexie. She was allowed home the same day, but went back in hospital a couple of days later because she wasn’t feeding well. The Hospital did some tests but found nothing wrong. They did however express concerns that her head was an unusual shape and her features were ‘different’. They suspected she had Down syndrome, but the tests were negative and she was sent home. Lexie came to live with us when she was 11 weeks old. 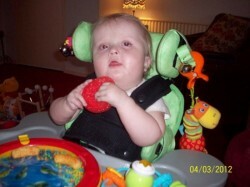 We were devoted to giving her a loving home and special family life following her difficult start. When Lexie was 3 months old we were called on by a Health Visitor who told us she wasn’t developing or meeting expected milestones. At six months old eye tests showed she had virtually no vision and at 9 months old she was assessed as having a mild hearing loss. Disappointingly Lexie had reached 10 months old before we received the devastating news that she had a rare metabolic illness known as a Peroxisomal Biogenesis Disorder which was part of the Zellweger spectrum and was terminal – we were told she wouldn’t live past child-hood. Lexie’s illness was progressive. She had a large liver and spleen, and her blood didn’t clot very well. Lexie needed supportive seating as she was unable to hold her head up independently and she was very floppy. Because she was both visually and hearing impaired she needed lots of sensory stimulation and she had a ‘Resonance Beanbag’ to help her enjoy music and sounds. Lexie became a regular visitor at Bluebell Wood, our local children’s hospice, making use of the daycare sessions; she particularly enjoyed the music therapy sessions and even appeared on Daybreak TV with her mummy and daddy when the hospice was being filmed for a Christmas special back in 2011. Lexie went to her first Halloween Party in 2012. She had such a fun time dressed as a witch, and then greeted trick or treater’s at home in her pumpkin onesie. Christmas 2012 was a very special time for Lexie. She went to a Breakfast with Santa event at the Clumber Park Hotel, a big Christmas Party in Sheffield with Bluebell Wood, and had a lovely Christmas day with all the family she loved. In April 2013 we took Lexie on holiday to Scarborough and she had a lovely time singing and gurgling and giggling all day long. Sadly, aged two and a half Lexie passed away following a short period of illness. We managed to bring her home and she died peacefully in my arms on 18th June. For her funeral she had a pink coffin with balloons and butterflies, and was carried to church in a glass carriage pulled by four white horses – it was a send-off fit for a princess. It wasn’t easy caring for Lexie, and each day seemed to bring new challenges – however it was incredibly rewarding. We tried to concentrate on the positives and rejoiced in each new achievement – learning to clap her hands was a big deal for Lexie. She always did things at her own pace, and was very resourceful given her sensory impairments. She had a wonderful personality, was always smiling, and entertained us with her antics every day.